Microsoft is expected to unveil the successor to the Surface Pro 4 tomorrow at a special event in Shanghai. There is not much that we know about the new hybrid device at this stage, other than it will look very similar to the current model, but the software giant hints that there will be four new Type Covers available for it. 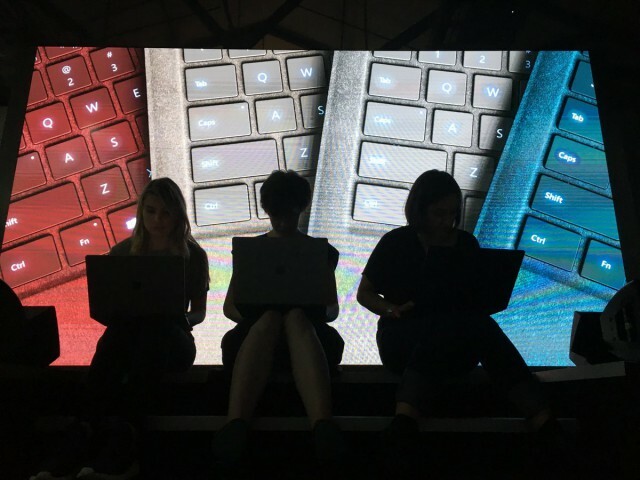 Microsoft's corporate VP of Devices, Panos Panay, has posted a photo on Twitter which shows the keyboard in what appears to be red, gold, gray and blue colors. That would match the keyboard colors of the Surface Laptop, which was introduced early this month. The colors for the Surface Laptop keyboard are officially referred to as Burgundy, Graphite Gold, Platinum and Cobalt Blue, so it's likely that the new Type Covers trims will have the same name. The photo also indicates that the new Surface Pro keyboard will have the same alcantara finish as the Surface Laptop's keyboard. The teaser gives credence to the latest Surface Pro rumor, which claims that the device and accessories will be offered in four different colors. The rumor also suggests that the new device will be officially called simply "Surface Pro" and not "Surface Pro 5" as one might expect, given Microsoft's naming preference. We can assume that Microsoft has updated the internals for the new Surface Pro, to bring it closer to other devices in the range and newer competitors. It will be interesting to see what sort of effect (if any) this will have on pricing, as the current model kicks off at $799 at the time of writing this article, without factoring in any discounts.